Is there significantly more younger players playing in pga tour events than there was 2 years ago? If so do you expect this curve to be pushed back to the left (peaking and declining at a younger age), or do you expect players to peak sooner and maintain the peak (or near peak) longer? I would be surprised if there were more younger players than 2 years ago. In fact, I imagine eliminating Q-School qualification has culled the youngest players who were earning their way in. I’d like to get around to updating this study now that I have more and better data. 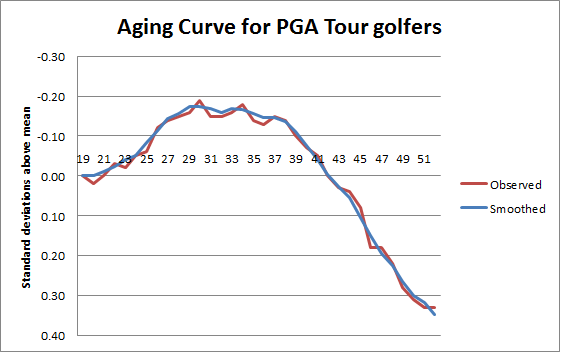 If I do, I’ll take a look at the age distribution on Tour/how it’s changed recently. Thanks for the reply, and for all the great articles on this site. I suppose my thinking there are more younger players is just a skewed perception based on the success of Spieth, Thomas, Finau and the rest of the young guys performing well. What would you estimate your standard deviation is here converted to an average round metric? 2 to 3 strokes?